I brought in these to work today and already sold them to my fellow nerds here at work. And i have another order already for more! I love these very very much. I made them all yesterday during pj and movie day. 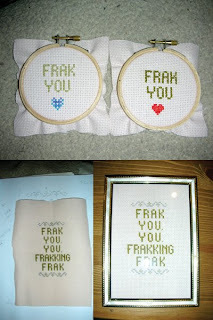 Frak you and your fraking good idea! Aww Pj and movie day , you are so freakin cute. I'm one of the frackin' nerds and I frackin' love them! Great FRACKING job!! !